ANNA MARIA – The cool temperature Sunday evening was perfect for a walk around the block, and that’s what a group of worshippers did as they celebrated Roser Community Church’s Annual Bethlehem Walk. The trek included a few stops to ask innkeepers if they had room for Joseph, played by Mark Morse, and Mary, played by Maggie Carlson. 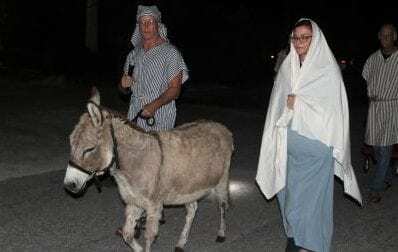 Walkers were joined by barnyard animals brought out to Anna Maria for the occasion, including a llama, lambs, baby goats and the donkey that accompanies Mary and Joseph on the way to find housing for the night. The walk covers approximately one block in Anna Maria, ending back where it began at Roser with the revelation of the baby Jesus, this year played by Arianna Wade. Afterward, participants are invited to come into the fellowship hall to enjoy cookies, coffee, hot chocolate and other treats provided by the church. The Bethlehem Walk began years ago. Nobody remembers when, but it was an opportunity for young and old alike to experience the night Christ was born. Attendees are encouraged to get into the spirit of the season and the walk by joining the actors in wearing costumes, provided by the church for visitors to borrow for the event, and sing Christmas carols along the way in between stops to visit with innkeepers. This year, patrons of the Waterfront Restaurant, located along the Bethlehem Walk’s path, joined in on the fun, singing along, taking photos and wishing the walking group a Merry Christmas. As the walk progressed, the group was joined by more people who took to the street on foot and by golf cart. The annual procession takes place typically the first weekend of December and is traditionally begun after sunset. Attendees are always advised to bring a flashlight to help light the way.